The FedExCup is a championship trophy for the PGA Tour. Its introduction marked the first time that men's professional golf had a playoff system. Announced in November 2005, it was first awarded in 2007. Justin Rose is the 2018 champion. This competition is sponsored by FedEx. In February 2008, the changes were designed to allow more golfers a chance to improve their positions on the points list as the playoffs progress. The changes involve a tightening of the playoff reset points and awarding more points to playoff participants. This is effectively a penalty on those players who skip a playoff event. In November 2008, the changes were designed to help ensure that the championship would not be won until every golfer who qualified finished playing the final playoff event. This resulted from the fact that Vijay Singh had accumulated enough points through the first three playoff events in 2008 to guarantee that he would win the Cup without finishing the final event. In 2013, FedExCup points began to determine the 125 golfers who would retain their PGA Tour playing privileges (popularly known as "tour cards") for the following season. Previously, this was determined by position on the tour's money list at the end of the year. The season structure changed beginning in the fall of 2013, but the qualifying criteria have not changed since 2009. Through the first part of the season, the "regular season" from October through August, PGA Tour players earn points in each event they play. The number of points for winning each tournament varies from 250 to 600, depending on the quality of the field for each event, with the typical tournament awarding 500. Fewer points are awarded to other players who finish each tournament, based on their final position. The goal is to be among the top 125 points leaders following the final event of the regular season. Only those players who are regular full-time members of the PGA Tour earn points. A non-member who joins the PGA Tour in mid-season is eligible to earn points in the first event he plays after officially joining the Tour. At the end of the regular season, the top 125 players participate in the playoffs. The number of points awarded for winning each playoff event is 2000, which is four times the amount awarded for a typical regular season tournament. Points won in playoff events are added to those for the regular season, and the fields are reduced as the playoffs proceed. Since 2013 the top 125 on the FedExCup points list also retain their tour cards for the following season. After the third playoff event, the top 30 players advance to the final event. Accumulated points are reset, so the #1 player has 2000 points, the #2 player has 1800 points, down to the #30 player who is given 168 points. This ensures that any of the 30 players has a chance to win the FedExCup, but the top players have the best chance, with the top five players assured of winning the FedExCup by winning the Tour Championship, which is held at East Lake Golf Club each year. Once the 125 playoff qualifiers are set, no alternates are allowed. Any player among the final 125 (then 100, then 70) can skip a playoff event prior to the Tour Championship, but if he does, he risks his standing on the points list, which could result in being eliminated from the playoffs. For the Tour Championship, only the top 30 points leaders after the BMW Championship are eligible. If for any reason, a player among the top 30 does not compete in the Tour Championship, he will not be replaced. The player with the most points after the Tour Championship wins the FedExCup itself and $10 million of a $35 million bonus fund. The runner-up gets $3 million, 3rd place $2 million, 4th place $1.5 million, 5th place $1 million, and so on down to $32,000 for 126th through 150th place. Beginning with the 2013 season, non-exempt players who finish 126th-150th in the FedExCup are given conditional PGA Tour status, but can attempt to improve their priority rankings through the Web.com Tour Finals. Previously, conditional status was earned through the money list. Also through 2012, the top 125 players on the money list will be fully exempt for the following year, with other golfers either eligible through other exemptions or needing to qualify by other means (e.g. "Qualifying school"). 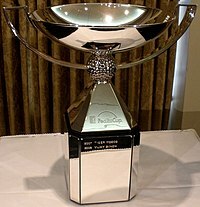 Starting in 2013, the players retaining their cards will be the top 125 on the FedExCup points list, with the next 75 on the points list having to enter the Web.com Tour Finals for a chance to retain their cards, unless otherwise exempt. ^ "The Changes: What to know". PGA Tour. February 28, 2008. Archived from the original on September 29, 2012. Retrieved September 24, 2012. ^ "Five key structural changes about '09 FedExCup". PGA Tour. September 24, 2011. Archived from the original on September 21, 2012. Retrieved September 24, 2012. ^ a b c d Dell, John (August 23, 2012). "Web.com impact expanded with qualifying changes". PGA Tour. Retrieved August 30, 2013. ^ Van Sickle, Gary (August 21, 2007). "A Guide to the FedEx Cup". Golf.com (Sports Illustrated). Retrieved September 24, 2012. ^ Wetzel, Dan (September 4, 2007). "Billion to one". Yahoo! Sports. Retrieved September 24, 2012. ^ "PGA Tour will have two-week break for Ryder Cup". ESPN. Associated Press. November 13, 2007. Retrieved September 24, 2012. ^ "PGA Tour FedExCup Bonus Money". PGA Tour. Retrieved September 23, 2013.